Microsoft is phasing out the app store for users of Windows Mobile 6.X, in an effort to push the last remaining users of the platform to the new Windows Phone 7. The company posted the official word Thursday that after May 9 no one can buy or download apps from the Windows Marketplace for Mobile 6.x app. 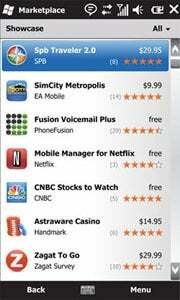 Microsoft launched the Windows Mobile 6.x Marketplace (not to be confused with the Windows Phone Marketplace for Windows Phone 7) in 2009 as a catch-up to Apple’s App Store, which at the time had some 35,000 applications (and now claims more than 550,000 apps). Microsoft abandoned the 6.X platform since in favor of the fresh Windows Phone 7, which has its own app store, separate from the old version. The shut down of the Windows Mobile 6.x Marketplace on May 9 means users won’t be able to browse, buy or download directly from the app store app. You can still download apps from third party app stores or directly from developers’ websites, just not from Microsoft’s store. If you are still using a Windows Mobile 6.x, this will be your last chance to update any apps available from the Marketplace, so if you wipe or reset your phone you won’t be able to recover the apps and data from the Marketplace after the May 9 cut-off date. Any apps downloaded before this date, however, will continue to work normally even after the store is shut down. Microsoft’s remaining mobile app store, Windows Phone Marketplace for Windows Phone 7, is meanwhile making steady progress. Latest reports say it offers more than 50,000 apps as the Windows Phone 7 platform holds less than 2 percent of the mobile market share (although Microsoft claims more than 60,000 apps in its farewell note to the Windows Marketplace for Mobile 6.x). It took the Windows Phone Marketplace 14 months to reach the 50,000-app mark, while Google needed 19 months to get the same result, and Apple hit that milestone in 12 months.